We were just passing through this area while waiting for our son to arrive on the New London ferry. It was just enough time to enjoy the Florence Griswold Museum garden, or Miss Florence’s garden as it is known, in Old Lyme, Connecticut. 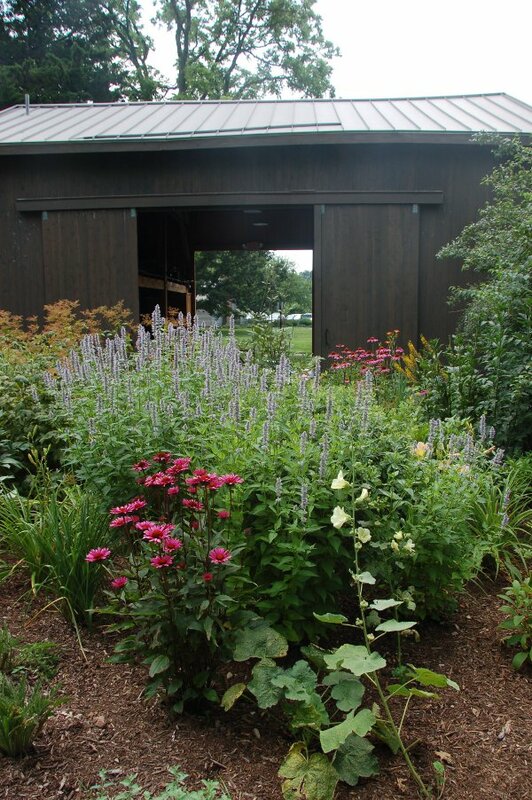 It is a grandmother’s garden filled with old-fashioned blooms such as hollyhock, iris, foxglove, poppies, phlox, and daylilies. The garden was actually started in the mid 1800′s by Florence’s father, Robert Griswold, a sea captain at their Georgian-style mansion built in 1817. When the family fell on hard times after the Civil War, they started a school and then a boardinghouse at their home. In 1899, an artist Henry Ward Ranger visited and decided it would be a perfect place to establish a school of landscape painting. And thus the Lyme Art Colony was born with such illustrious members as Willard Metcalf, Matilda Brown, William Chadwick, and Childe Hassam, who changed the focus to impressionism in 1903. Miss Florence was a kind and generous hostess who made the artists comfortable and encouraged their efforts. 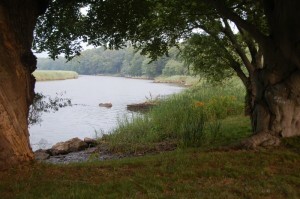 They drew their inspiration from her garden as well as the surrounding landscape – the winding Lieutenant River, which eventually meets the Connecticut River, passing through the salt meadows. The surrounding landscape also included rundown structures and buildings in the village of Old Lyme and the town of Lyme. These were remnants of former shipbuilding days as well as old farms, and grist, saw, paper, and textile mills. It all made for nostalgic and picturesque scenes for their paintings. Miss Florence’s garden followed in the Colonial Revival tradition gaining popularity in the later 1800′s, in contrast to the more formal Victorian estate gardens. We may look at the 19th century as being a more simple time, but in the late 1800′s people started looking back to the Colonial era, before the Industrial Revolution, as a refuge from what they perceived as the frantic pace of their modern life. The Colonial Revival gardens harkened back to a less pretentious time, with rectangular beds filled with old-fashioned flowers in the English cottage style. Miss Florence was keenly interested in horticulture and was constantly seeking out new plants and ordering seeds from catalogues. She filled her home with her arrangements and helped several artists establish gardens at their own homes. After her death in 1937, the garden fell into disrepair. An archeological dig in 1998 helped the Museum identify the boundaries of the garden, walkways as well as orchard and outbuildings. With the help of paintings and photographs, the garden was restored to how it looked in 1910. It not only contains traditional blooms but also has vegetables such as squash, pumpkin, and asparagus. But it’s not only the garden that is of interest here. We walked to the back of the museum building, there was a cafe overlooking a scene that looks untouched since the art colony was here. There are Adirondack chairs for the visitor to sit and take in the gentle beauty of the river slowly flowing through salt meadows on its way to the sea. Unfortunately, we didn’t have time to go through the museum, which houses the paintings of members of the Lyme Art Colony. But it is a rare opportunity to see the settings for these paintings just outside the door.